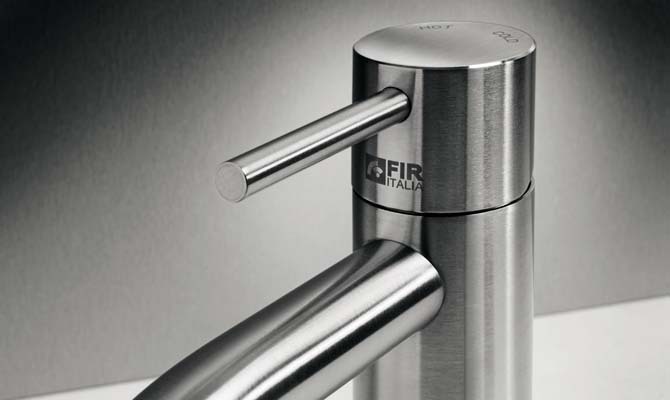 The first Fir Italia "Green" Total Look tap and mixer collection made of AISI 316L stainless steel. Now available! 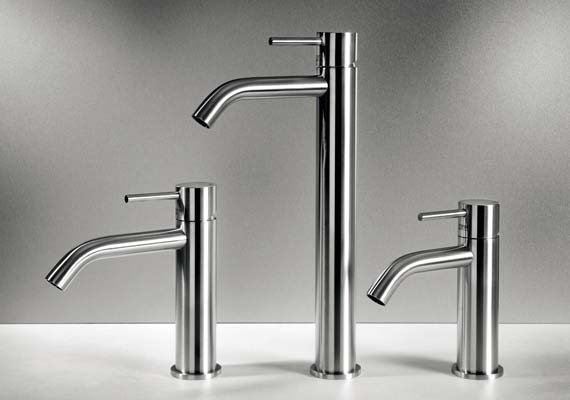 The CleoSteel 48 collection is the first Fir Italia "Green" Total Look tap and mixer collection made of AISI 316L stainless steel. CleoSteel is the interpretation of a cylindrical minimalist design, whose pure and simple forms, with a 40-mm diameter stainless steel body, are easy to incorporate in bathrooms with different identities. CleoSteel is also available in the variant “mini”, even more minimal and with a 35 mm diameter body. 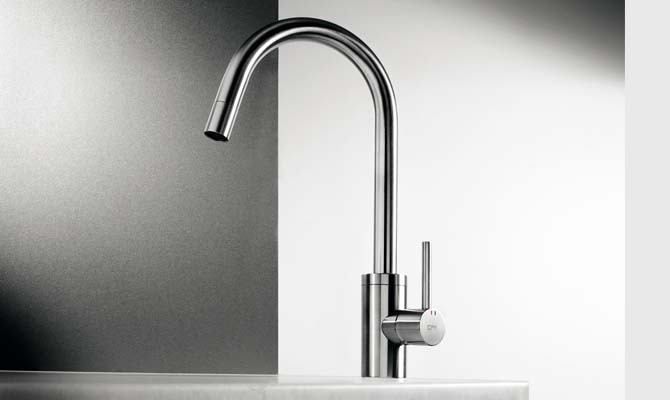 Fir Italia stainless steel taps and mixers are also provided for the kitchen world, where the characteristics of AISI 316/L stainless steel are just as important as they are in the bathroom: maximum hygiene and easy to clean; high resistance and durability; ecofriendly and 100% recyclable. A new way of looking at the bathroom. 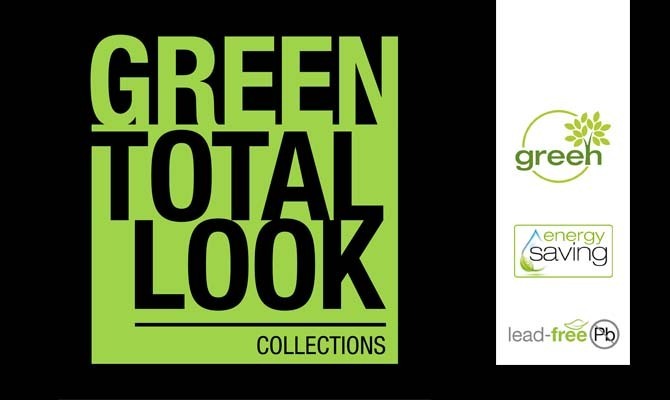 “Green” Total Look is a new and revolutionary “bathroom concept” that proposes taps and mixers for the bathroom and shower solutions which are safe for both the environment and people, in line with the new trends and needs of interior design and furnishing. • Eco-friendly, reliable and totally hygienic materials. 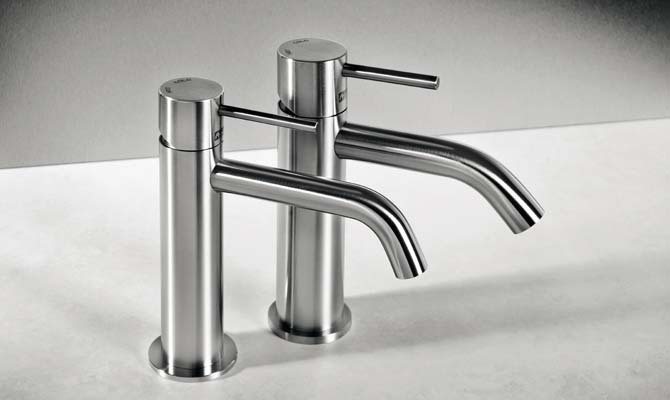 AISI 316/L stainless steel taps and mixers. Relevant built-in parts in lead-free DZR brass. • “Energy saving” solutions to optimize water consumption. 6 l/m flow restrictors installed on all taps and mixers and 9 l/m flow restrictors on all shower heads, with a consequent saving of about 50% of water consumption in the bathroom. • Ultra-minimalist design of new generation. Reinterpretation of the squared and cylindrical styles thanks to the stainless steel characteristics. AISI 316L stainless steel is a corrosion-resistant material, widely used for its excellent hygiene, simplicity in cleaning, high resistance, eco-compatibility and 100% recyclability. 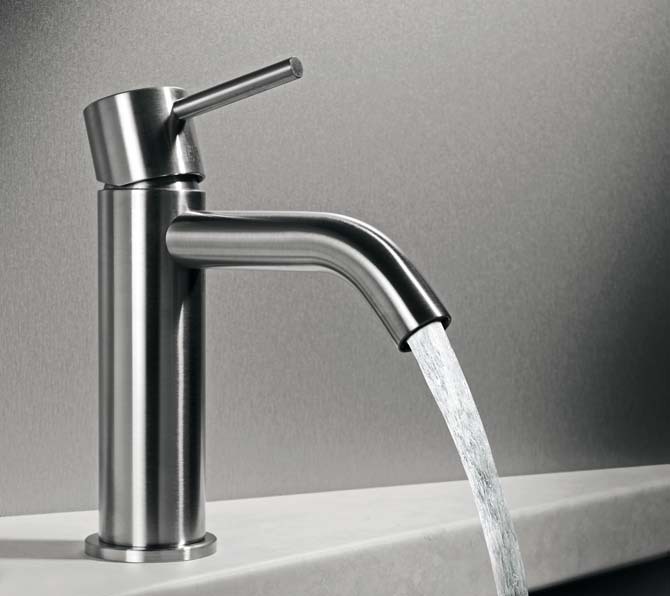 Taps, mixers and shower heads made of stainless steel are safe for both the environment and people because they guarantee no release of heavy metal residues which can damage health; as well as a high durability over time. 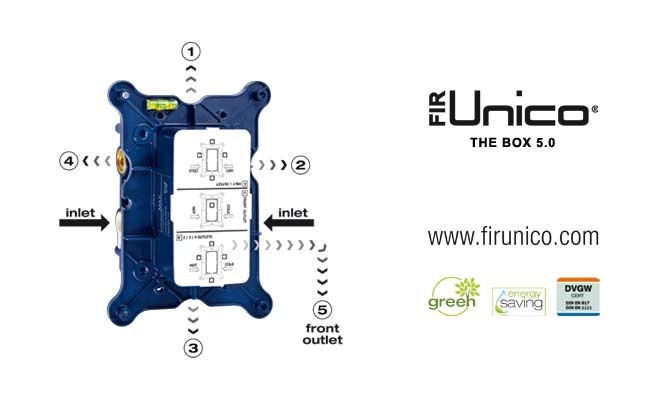 FirUnico® is the new universal built-in system with 5 outlets, compatible with all of the built-in wash-basin and shower solutions in the Fir Italia tap collections. 5 outlets, including 4 side outlets for the shower area and 1 front outlet for the wash basin area. Possibility of choosing among the 4 shower outlets, according to the design of the shower system you want to realize. 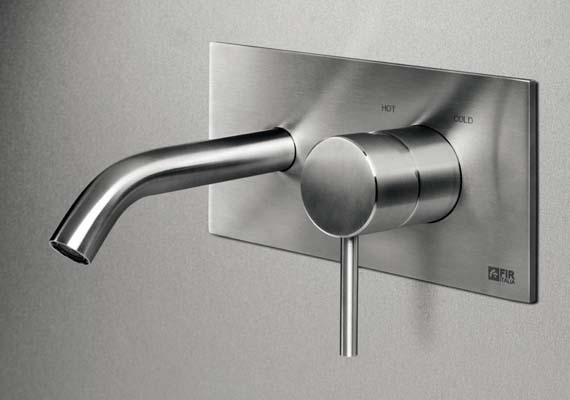 A single built-in system for any kind of built-in shower and wash basin mixers, whether traditional or thermostatic. * Maximum lead content of 0.2%.